Get your kicks from marine sports in the Okinawa’s largest transparence beach. Sometimes there are more beautiful beaches than the main island of Okinawa. Ikei Island is one of the most beautiful beaches around. You can go snorkeling, ride the banana boat, wake boarding, and riding the marine jet. The beach is popular with the local people especially for marine jetting. The restaurant near the entrance is popular with hearty Okinawan food. 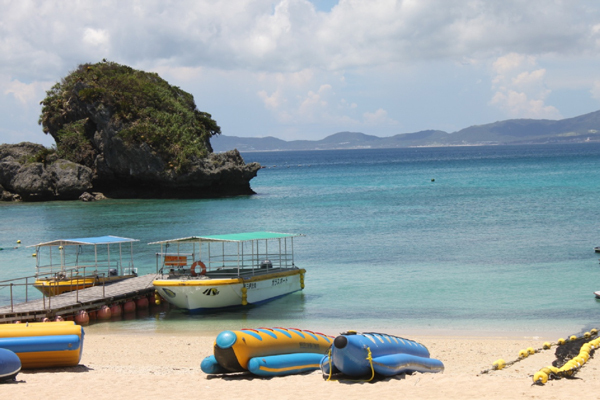 Ikei beach is about a 40 min drive by car from Okinawa North IC (Express highway).